The warm sun greets me as I walk the retreat center grounds. Befuddled birds tweet their spring songs, confused by the warm December day. Kids at the adjacent playground squeal and run without jackets or snow boots to slow their pace. I join their excitement. I welcome another sun-filled bonus day during what’s usually the darkest, coldest stretch of the year. On the back end of the property, I find what brought me here. A perfectly arranged, circular stone path resides in an open field next to the woods. I’ve visited this labyrinth before. It’s a special spot, tucked away from highways and shopping malls. It’s peaceful. Prayerful. Meditative. As the holidays draw closer, I need a break from my overflowing calendar. A nearby errand brought me to the neighborhood, but the whisper in my heart beckoned me to the labyrinth. I’m learning to listen to that wise inner voice. 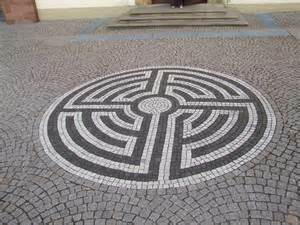 A labyrinth is a circular type of path arranged in a precise, maze-like formation. It’s meant to be walked contemplatively. The meandering path takes you to a center, where you can pause for prayer or intention, then follows in reverse to walk out. Although the origins are unknown, many can be found in the paving stones of cathedrals dating from the middle ages. Today they are often built outdoors in parks or spiritual retreat centers. I was first introduced in my early twenties when a work friend invited me to her home. She and her husband built one amongst the beautiful landscape of their backyard. It felt strange and mystical to me, anachronistic in her suburban neighborhood. I noticed my pace slowed as I walked the circling path. I became mindful of every step. Whenever I walk one with prayerful intention, something happens: a solution is discovered or a truth is revealed. On this day, I step onto the first stone, breathe slowly, and begin my walk. I remind myself to stay present when my thoughts wander toward my to-do list. Although it is noon, December’s sun is low on the horizon. Tall pines shadow the farthest side. It’s colder there. Darker too. I hurry through the shadowy sections. I don’t want to be slow and contemplative where it feels cold and dark. I want to get back to the sunny side. At the labyrinth’s center, I pause to feel the sun warming my face when the lesson hits me. Every journey has light and dark. The verse from Ecclesiastes comes to me. “To everything there is a season….A time to be born, and a time to die; a time to cry, a time to laugh; a time to tear apart, and a time to sew together.” Yes, I think, every journey has light and dark. Slowly I begin my walk back out of the labyrinth. I try to keep my pace even in the shadows and the sunshine, attempting to appreciate both. Afterall, it’s human nature to desire the sunny side of everything. Find the answer. Solve the problem. Move on. Our culture encourages us to race through difficult times. While staying mired in darkness can be unhealthy, so can believing we must rush ahead, never fully investigating what is there. How will I understand what the darkness can teach me if I only push through it? Can I walk just as mindfully in the shadowy parts of my journey? Can you? To everything there is a season. As our calendar moves through the longest night of the year, I hold vigil, knowing there is room in my heart for both light and dark. Beautiful, Katie! And what an auspicious day to launch your blog. It is challenging to stay in the darkness long enough to learn from it without becoming mired in it. I love the image of a labyrinth to explore this – not often thought of together. Thank you. Bravo Katie. Well written and insightful! Such a lovely expression Katie. I too LOVE labyrinths for the calm they provide and the insights I gain. Thank you for sharing this. Beautifully written.